Blend ketchup, soy sauce and Worcestershire sauce to help pack flavor into this Cheesy Turkey Meatloaf. Add shredded Mexican-style cheese and chopped veggies and you've got a great weeknight entrée! 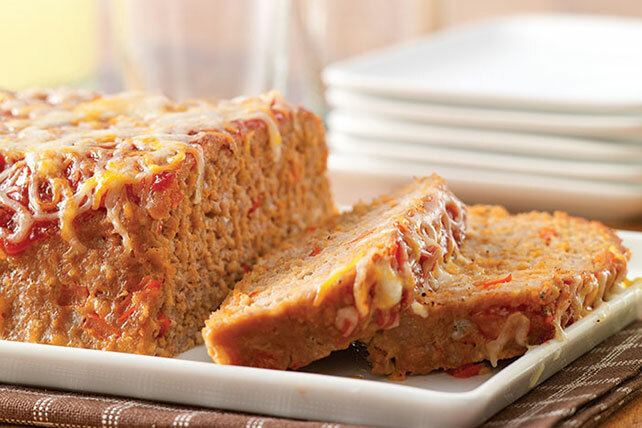 Try Cheesy Turkey Meatloaf any night of the week. Cook and stir red peppers, onions and garlic in hot oil in large skillet on medium heat 5 min. or until crisp-tender. Stir in black pepper; cool. Mix egg, 1/2 cup ketchup, soy sauce and Worcestershire sauce in large bowl until blended. Stir in vegetable mixture. Add turkey, cracker crumbs and 3/4 cup cheese; mix just until blended. Shape into 10x5-inch loaf in shallow pan; top with remaining ketchup. Bake 55 min. to 1 hour or until done (160ºF), topping with remaining cheese after 50 min. Serve with a cold glass of prepared CRYSTAL LIGHT Lemonade Flavor Drink.